The Nunat Reflect Jacket is a versatile down jacket with a secret weapon: a reflective inner mesh that keeps you warm to the core. Heading somewhere cold? 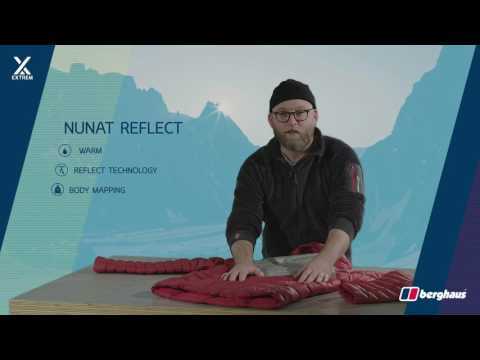 Make sure you pack the Nunat Reflect. Stuffed with our super-warm Hydrodown® insulation – which goes on working even when wet – there’s more to this climber’s favourite than meets the eye. As well as body-mapping technology, which puts heat right where you need it, the Nunat has an internal reflective mesh in core body areas – giving you up to 10% greater thermal efficiency, so you stay warm for longer. Think of it as your personal central heating on long treks. Without the banging pipes. LONG LASTING WARMTH - Filled with our world-leading ethically sourced hydrophobic down, Hydrodown® powered by NikWax® – for long-lasting warmth that keeps on working when wet. INTELLIGENT HEAT DISTRIBUTION - We used innovative body-mapping techniques to ensure efficient distribution of heat. So you won’t get any cold patches creeping in. KEEP YOUR HEAT - Ultra light reflective mesh inside the jacket reflects your hard earned body heat back in, keeping you 10% warmer. A super lightweight 15 denier PERTEX® QUANTUM® fabric that is windproof and highly breathable. Reflect™ aluminium mesh sewn into the core of the jacket reflects body heat back, raising the warmth by 10%.